The airline will restart its flights to the Iranian capital on 17 April. Management last week circulated a note asking female staff to wear trousers on the route and put on a headscarf when they left the plane. 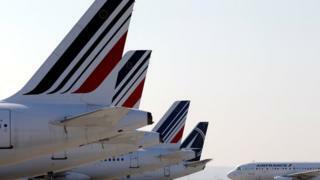 Union officials said some staff members were concerned about the ruling and had asked Air France bosses to relax it. Ahead of a meeting with a number of unions on Monday afternoon, Gilles Gateau, Air France's human resources director, told the Europe 1 channel he was willing to offer a compromise. "We're going to present them with an opt-out clause for any female employee affected on the Paris-Tehran route," he said. "If, for personal reasons, they don't want to wear the headscarf when they leave the plane, they would be reassigned to another destination." Mr Gateau said the company "had heard from a number of women, be they air hostesses or pilots, who said following this rule would be a problem for them". Flore Arrighi, of the cabin crew union Unac, said before the meeting it was crucial that staff who opted out of flying to Tehran were not sanctioned by Air France. Over the weekend, the company pointed out that the rule had also applied on its routes to Saudi Arabia which, like Iran, expects women to wear the headscarf in public. Air France also said the requirement had been in place on the Tehran route before it was suspended in 2008. It was reinstated after a warming in ties last year between world powers and Iran in exchange for it curtailing its nuclear programme.